The rest of this page contains the results of my intrepid explorations of the virtual theater organs. 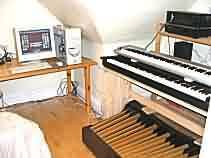 ... To cut to the chase, for someone with an unpretentious setup of a Windows PC + some MIDI keyboards, there were two leading free virtual organ contenders — the Miditzer 216 and the Hauptwerk Paramount 310 (without Hauperwerk’s annoyanceware feature, which got rescinded we hope ). 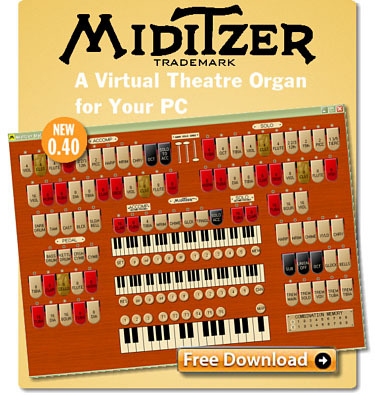 So if you want a free computer theater organ, the Miditzer 216 is the obvious first choice, albeit with numerous drawbacks. ... Paramount/hauptwerk partisans are fanatically convinced that theirs is the finest of all virtual theater organs, and if you want to try it with the idea of maybe buying — and it’s not cheap — that’s almost rational. But it’s much harder installing Hauptwerk & the (free) Paramount 310, so if you plan to go for the free option, the Miditzer 216 downloads and installs in a few minutes. ... The catch: the Mitz has no auto-learn, and in general is harder/impossible to configure once you’ve installed it. Plus Miditzer’s got the dreaded (but authentic!) latency. And a scamloader, maybe. There are indeed beautiful virtual organs for free — but in addition to a working PC, you still need sizable chunk$ of hardware to play ’em — although you can tinker with just the PC + the rudimentary sound system most PCs come with. 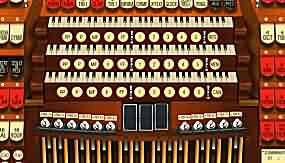 As I mention in more than a few places on this enchanted site, actually doing the typical theater organ’s vast assortment of stop tabs is usually impossible, miditzer or hauptwerk — at least without a MIDI-fied theater organ console, a much more challenging project than just getting hold of a virtual organ or two. ... There aren’t nearly enough buttons on most (all?) store-bought MIDI keyboards. My Nord has enough buttons for 20 or so combos, but I didn’t even try to implement any stop tabs. ... This tab poverty doesn’t bother me ’cause I can’t play that good anyway. But it annoys the competent, particularly those who have played actual theater organs. The free Hauptwerk Paramount 310. And a pricey flavor. Windows system restore & other threats and destructions. The warts of the Paramounts. An Organ in the Living Room? 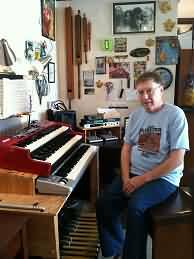 It really is lovely — after a few hours I was playing a beloved Bill Irwin arrangement on my Nord plugged into a Windows laptop, regaling the empty room with Que Ser� Ser�, incompetently as ever — but on a throbbing reverberant Wurlitzer(esque) theater organ! ... If my electronic debris can be a Wurlitzer, and now I believe it can, or at least I can get an inkling of what the insiders @ the ATOS Journal are always babbling about. ... Mr. Henry’s creation actually makes clonking noises when one clicks one of the “combination” buttons, as bunches of imaginary stops shift! 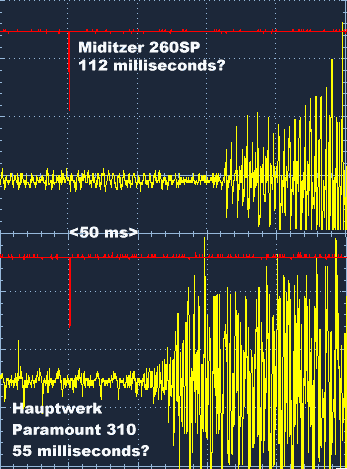 Latency: An annoying delay between key press and Miditzer sound. ... As an intelligent fellow pointed out — I think it was at the Organ Forum, but it might’ve been Miditzer’s forum — probably Jim Henry! — real pipe organs often do that also. ... I of all people should know this; aside from my formative years playing one — badly, to be sure; it was probably the delay! — I actually wrote a scathing review in the late lamented NY City College Observation Post condemning the inaugural concert of a new organ (probably electronic) because the organist hadn’t figured-out how to play the thing so the audience could hear a coherent performance. I probably didn’t know the word except as an unrelated euphemism, but that was doubtless the dreaded latency. I got Miditzer playing with the Nord’s two manuals in a few hours, with luck + geekery, but the pedals wouldn’t work. After much agony it turned-out to be my Nord’s fault and not the saintly Miditzer’s: the Nord is supposed to emit MIDI from the swell, great, and pedal keyboards, on MIDI channels 1, 2, and 3, which apparently is just what Miditzer expected, but the pedals didn’t go. So I googled assiduously and wound-up at a Nordish forum where I learned I could fix this Nord bug by changing the Nord “system” menu parameter #11 “Trigger Mode” from “High” to “Low” — and I realized it was abysmal dark ignorance such as this which would continue to make my new-found virtual world such a rocky road. ... The Nordniks are convinced that playing the instrument that way is a sham and a delusion, but I couldn’t tell the difference and for all I know it makes it easier! ... I know setting the Nord drawbar action from “fast” to “slow” made the imaginary drawbars less temperamental. So I went and got the crucially-useful and free MIDI utility MIDIox and proved to myself Nord was doing the right thing — i.e. as opposed to my pitiful experience above. So then I realized I had completely ignored an essential component of the ridiculously technical MIDI mysteries — MIDI channels! ... Foolish child that I was, I had neglected to right-click on the Miditzer Expression Tab “ON” column and select something other than “AUX” — “solo” seemed to work. ... And thus I finally realized these settings signified MIDI channels 1, 2, 3, with AUX == 16? — which was obvious after I bothered examining the Miditzer input screen where they’re defined. ... What an ignorant simpleton I was!!!! The Rollicking Fun of MITZTECH! In the wandering years I finally attached a 2nd larger display to my mitz laptop’s VGA port, and used the Windows 7 gadget to configure things (search the Windows’ Control Panel for “multiple monitors”, and then click “Set up computer to use multiple monitors”) — but programs kept starting on the smaller laptop screen and, worse, Miditzer, even when moved to the big monitor, wouldn’t get bigger! ... 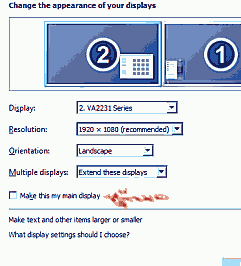 The secret: Check the box “Make this my main display” for the screen where you want Miditzer to appear — and be bigger! ... It’s all so simple! ... Although I should note much other stuff then gets weird, but you didn’t want to actually use your computer for anything else did you? Hauptwerk of course remembers its Window positions politely and restores itself to wherever you closed it. Except when you foolishly change your hardware — to a touch screen, say — and it doesn’t and hides one of its windows underneath, and since there are about 5 million of them it can be stressful to find which one exactly is hiding. Both the Hauptwerk Paramounts and Miditzer have promotional (?) aspects that confused me at least. ... Both have free and for-money products, but efforts to use one to promote the other or whatever they’re doing only conveyed to me impenetrable murk. 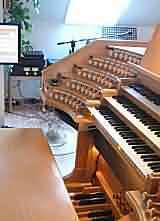 ... For months I couldn’t figure-out the difference between Paramount Organ Work’s free Paramount 310 and the 320 but eventually I found this, with a selection of useful links and even a prices tab! — gone now, but it used to show $179 for the 320 for which I eventually caved-in @ $100 + of course the exorbitant $250 for the requisite “Basic” Hauptwerk software. ... And I played the lovely Miditzer 216 for eons before figuring-out that the advanced 260SP model, which up to then I thought was some kind of legend or ancient broken artifact (like in that wacko Myst game), is in fact available now, somewhere (I googled for it), for a $100 donation. ... What tangled webs! ... All such things are no doubt immediately obvious to the psychically-gifted virtual organist, but not to my confused primitive perceptions. Price Free, but not obvious-enough; I’m fond of the $100 version but it has broken parts. Obscure free version + “Basic” $250 and “Insane Millionaire” $600 versions, both w/dongle, and the Insane version has multi-channel audio, individual pipe/stop “voicing”. But that’s just the Hauptwerk “host” program; additional Paramount theater organs might be $100 and up. Downloading Scamloader? ; small (5 megabytes!) 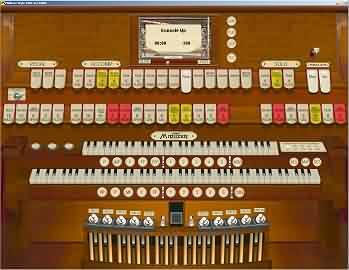 and takes a few minutes Vast, endless — 2.5 Gigabytes — free theater organ is another half a gig. Computer screen Eminently usable Too small; almost illegible; designed for multiple screens? Hardware hookup This handy chart assumes you have a MIDI gadget like my beloved Nord but if not, both Miditzer and Hauptwerk will make sounds with just a computer + the typical PC speakers — although Hwerk made such a fuss I wasn’t sure, but eventually after I turned-on a stop or two in the “tabs” display I could click the mouse on the console display keys and hear stuff. 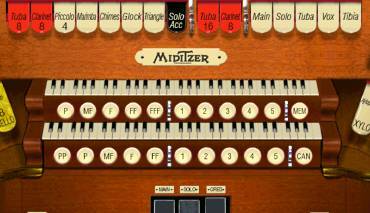 With Miditzer, you get to click the screen and play the PC keys! Obviously they both are better with MIDI keyboards + better audio. Hauptwerk also gets lower latency with USB audio, but not Miditzer. Both programs require technical configuration to unique MIDI channels/devices and numerous other maddening details, but the Miditzer requirements are significantly harsher with its barbaric manual MIDI configuration versus Hauptwerk’s modern “auto-learn”. Presumably because the mostly-free Miditzer has been without much development for years, while Hauptwerk is commercially-supported even as I blather. Although as is common in such situations, some Miditzer features work better than the presumably-much-labored-over Hauptwerk flavors. ... But for a basic computer + keyboards setup, they’re probably equally annoying — maybe Mitz a little less. If you want to get something going quickly and you’re using a Windows PC and you don’t mind the latency, Miditzer. With a PC or Mac made in the last few years and a good internet connection, Hauptwerk’s much better at configuring buttons etc. other than the keyboard, and even the keyboard configuration will often be easier. And it can have noticeably lower latency. One confounding distinction between the beloved simple-minded Miditzer and the Paramount 310 — well, it confounded me for days if not weeks — is that to play the 310 one needs two programs: (1.) the Hauptwerk free version, + (2.) 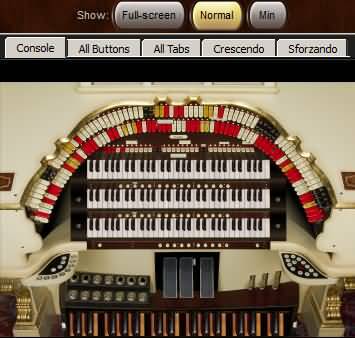 the Paramount 310 virtual organ. They must be separately downloaded, at the usual agonizing speed. First you download the Hauptwerk “host” program from http://www.hauptwerk.com/downloads/hauptwerk-downloads/. Don’t hold your breath; might be wise to engage in other tasks, like urethaning the floors, opening the vacation home. ... There is a $20 CD you can buy somewhere, maybe? At Wed 8/13/14 the 4.1 version of the Hauptwerk host program may have invalidated my otherwise perfectly-reliable notes here, and added a new annoyanceware feature which required “free” license renewal on the internet every 90 days — which aside from irking us proud and feisty freeloaders, gives Hauptwerk the option to cancel the free version whenever they feel like it, or just forget. ... Which of course they would never do. ... But then at 9/26/14 the annoyanceware feature was rescinded, we hope forever. The grand virtual 4-manual 50 rank Paramount 450 with all its required upgrades is available here maybe. Any Paramount model above the free 310 requires the $250 Hauptwerk flavor, but you insane millionaires will want the super-tweakable hwerk flavor, bringing your virtual organistic pleasure to $1,350 or so, at least whenever I wrote this — plus, I assume, additional infuriating copy-restriction / usb dongle technicalities. ... And the weary years passed me and I didn’t even notice the even more pricey Paramount “341” for another $100, and it requires the insane millionaire Hauptwerk. And even with the higher price, as the numeric code implies the 341 only has three manuals and a mere 41 ranks! ... A shocking retrenchment! ... Prices are only the home flavor; there are commercial performance licenses or something so you can pay through the nose for playing before vast audiences. ... But do check the site; prices vary, often lower! The Hauptwerk Paramount 310 screen as far as I’ve been able to determine in careful scientific tests doesn’t fit any computer I own. ... Which, to be sure, max out at what I thought was the “high-definition” 1920x1080 size. Hauptwerk has numerous panels, fascinating and amusing I’m sure, which actually get in front of the main screen! — they don’t “float” to the back, like all other software in creation. ... My screenshot above is the best I could do, with the “All Tabs” (i.e. stops) screen, which is what you probably use while playing. If you get upset at these minor electronic trifles, perhaps after paying for the software, perhaps while playing before hundreds of people — which seems unlikely to happen to me — try the free version for a few weeks ... or years. ... Although I don’t know how you’d test it. ... I mean really, the beloved Miditzer certainly has its crochets, but after two years neither has done anything pathological, at least not persistently. I guess I’m supposed to festoon the console with post-it notes saying DON’T RESTORE WITHOUT SAVING YOU DOLT and USE COMBO LOAD INSTEAD and perhaps I’ll get around to that someday. Or perhaps I’ll just spend more time with my beloved Mitz 260SP. ... What I will probably never do is upgrade the Hauptwerk software to the latest version; my fear is too strong. The Paramount 310 has three manuals, which seemed a little hard on my 2-manual Nord, but not really: theater organs are “unit” deals anyway and I just assigned two hwerk manuals to one of the Nord’s — until the advent of my dubious third keyboard. But for me, at least, I have to play actual music to tell how it’s going. Just poking at the thing is always confusing, theater or classical; I can’t tell if it sounds good or what. ... So I played Stormy Weather on both the Miditzer and the Hauptwerk Paramount 310, and they both sound wonderful! Anyway, the Paramount 310 comes with a lovely blower effect, so you can hear the virtual air wheezing through the mechanism as you play, but after a while I decided there was enough noise in my living room and clicked it off with the “Blower” button, at the “tabs” screen lower right-hand corner. But that doesn’t “stick”; it turned on the next time I loaded the Paramount 310. To make it stay turned-off, you right-click on the blower button, select “Adjust MIDI/trigger settings manually...”, and then at the top on the right of the form that shows-up, there’s a check box “Switch defaults to ’on’ state”. Uncheck that, and click OK, and the next time you start the Paramount 310 your virtual blowers will blow no more forever, at least by themselves until you click them on again with the “Blower” button. By Kenneth A. Spencer, who is a proud cog in the Hauptwerk industry. 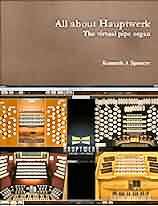 His <$30 (@ amazon) book started with filler about the wonders of reed instruments, pipe organs, Hammonds, & etc., but there appears to be a good deal of actual information on obtaining and setting-up Hauptwerk (with Windows) and the requisite MIDI debris and, really, it’d be churlish to complain about a $30 book if you’re at all serious about getting involved in the menacing world of Hauptwerk & virtual organs — it’ll be but a tiny bit in the general scheme of things, even if you stick with the free version. But then again, if you’re going on the freeway you could start by reading the free Hauptwerk PDF manual. ... And it should be noted that software is often documented in PDF files not just because it’s annoying — although surely that’s a motivation — but because the software, being so EZ to change and all, will be changed. Frequently. And then the printed book’ll be out-of-date, but of course the PDF’ll be updated in a little while, or within a few years or decades, surely. ... Mr. Spencer’s book is about Hauptwerk 4.2 which is I believe the current version @ 11/15. But, for instance, he attempts to show us how to use a Windows PC for hwerk, and refers to the “Start” button, which as all us attentive hacks know was expurgated from the repulsive Windows 8. I call it the Mighty Organ syndrome. People think they want a 50-rank organ in their living room but that’s just delusional. It’s a hobbyist/enthusiast symptom; they want to collect ’em all. It’s just like the high-fidelity lunatics: you can’t have a 100-piece orchestra in your living room, it will never sound like that. It might sound like something extremely loud, but it won’t be like being there. The sample-set lunacy is just newer, rawer, and sillier. It’s a tasteless quest for bigger/louder. ... And unnecessarily expen$ive, which does seem to be a recurrent theme in the modern man-cave hobby market segment. ... I mean, there is rubythevtpo.com, which is wondrous and obviously expensive and I would never wish to dim its brilliance, but surely telling people in a beginner’s how-to that this kind of thing is normal — well, someone might believe it! I have drivelled-on about how horrible it is to hook-up one of these virtual organs, but then a correspondent (!) 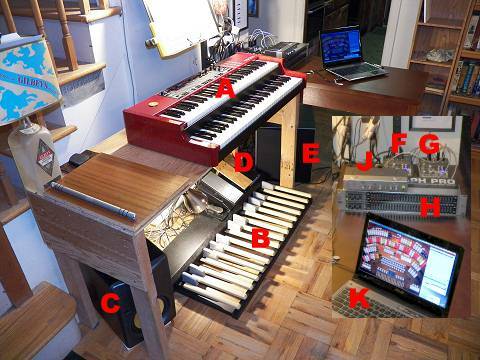 asked about hooking-up the Nord C2D, which is what I did (almost; I’ve got the crummier C2), and I realized that I hadn’t confided an important secret for that eventuality: I set the Nord to its baroque organ mode, not the hammond organ or other modes. It’s entirely possible some other Nord mode’d work good, but I doubtless tried a few in my usual floundering, and the baroque organ has unique MIDI events for the stops: one each for ON and OFF. The Hammond mode, for instance, will emit a slew of stuff as one adjusts a drawbar. For Mitz and Hauptwerk, I use these MIDI events to fire combo buttons of course — that is, one Nord stop button can fire two completely different combo buttons, without interfering with each other, at least on my C2. ... I set the combo buttons with a mouse or the touch screen. ... And there aren’t enough buttons in the world or at least on my Nord to fire all the theater organ stops. Anyway, I discuss the Nord in monstrous plenitude elsewhere, and the beginning of my mitztech diatribe relates to the difficulties of making the MIDI work with these machines in general. Miditzer’s latency makes it harder to play. But because my heart is pure and I kept playing or who knows, I finally discovered that when I launch into Stand By Your Man or the Wiffenpoof Song sometimes I just forget; the latency disappears somewhere — I play as badly as ever, but latency somehow isn’t a problem. ... And I can deal with Miditzer’s computery programming challenges better than the average techno-peasant, so Hauptwerk’s “learning” mode isn’t so enticing. ... And I don’t like programs or machines running all day and night, and Miditzer is more suited to stopping and starting, which it does much faster; including the little convenience of remembering the stops I had on yesterday. ... And my classical organ yearnings are filled more than adequately by my foresighted purchase of the Nord C2 with its achingly beautiful sampled baroque emulation. ... Finally, I like the way Miditzer sounds. ... So if I could only have one — it’d be Miditzer. But I can have both! And they were both free! ... But I can feel my character building as I somehow ignore Miditzer’s obviously inferior latency. Youtube is replete with Hauptwerk Paramount and Miditzer videos. The Paramount offerings sound a little classier, but probably because the Miditzer perpetrators tend to have lower-rent audio equipment, particularly since the POW promotes professional demos. My experience is the two are comparable, with the edge to Miditzer, but of course that’s me, playing badly. ... One impressive Youtube video is “J S Bach BWV 655 Miditzer 216 midi Virtual Organ”; it’s really lovely and classical! ... Or then “Misha Stefanuk performs Somewhere Over the Rainbow on the Paramount 320 Theater Organ” is very nice too; and he has a real video camera and everything. ... “Over The Rainbow Played On The Miditzer 216” is the low-rent competition: no reverb, no video — but a very plausible-sounding theater organ, and actually a few commenters complain about how good it sounds, presumably because they couldn’t make their Miditzers sound like that. Note that the free instruments are the “Miditzer 216” and Hauptwerk “Paramount 310”; but Misha there for instance plays the extra-cost Paramount 320, and numerous Youtube Miditzerim use the (virtual 3-manual) “260SP”. In the great Manichean struggle of Hauptwerk vs. Miditzer I have changed sides at least twice, which is pretty good for a novice virtual organist. My amateur standing is untarnished I believe. ... But nevertheless, at the end of a year or two I still prefer the Miditzer, now the 260, as compared to the Paramount 320. The Mitz is just nicer — which is presumably what Miles and Henry were trying to do, as opposed to the authenticity, numerous ranks, and/or warts (!) which are the professed goal of the Paramount Organ Works. I find it easier to play “theater organ-sounding” stuff on the Miditzer. ... My playing is no better than dubious, and my sound system also, at least compared to the exalted VTPO standard, so perhaps I would wholeheartedly recommend Miditzer to those with limited keyboard skills and cheap sound systems, if it weren’t for the Mitz’s more difficult configuration and of course that devilish latency. 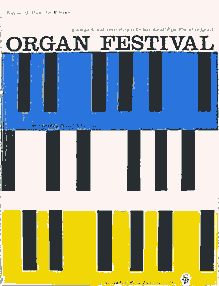 ... All of the [Paramount Organ Works] VTPO iterations are intended to be replicas of Pipe Organs and as we all know, pipe organs are seldom particularly even, not even with the best regulation in the world (which many don’t receive). 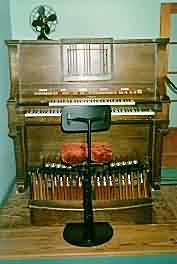 When attempting realism, organs are recorded “warts and all” which will include unevenness between pipes and ranks, pipes that don’t quite “speak” properly, chiffs, etc. etc. We have removed gross errors from our sample sets where possible, but smaller unevenness in some cases has been deliberately left alone. If everything was perfect, the organ would sound far from real and rather sterile. If you want to correct uneven audio levels in pipes, you would need to use the voicing capability in Hauptwerk Advanced edition. Details are to be found in the relevant sections of the Hauptwerk User Guide which itself can be found by clicking on the “Help” tab within Hauptwerk. ... which sounds plausible — but debatable. ... 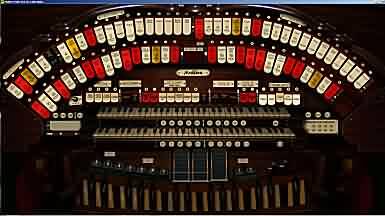 I imagine, for instance, the theater organ purchaser in 1925 debating with the Wurlitzer sales organization, when they explained such defects in a new organ that way. And I believe other VTPO postings have indicated the POW organs aren’t replicas of individual instruments, but include samples from different organs, which makes the “warts & all” theory even more obscure — is it supposed to be an authentic “frankenstein” organ? ... Perhaps they select the most illustrious warts from the group? No; the reality is that all sampled instruments, from trumpets to ridiculously expensive piano VSTis to our beloved virtual organs, will execute on a spectrum between ugly and good, like the rest of our sad mortal world. Describing an ugly electronically-simulated musical instrument as “replicating the original” is not an explanation but an excuse. ... Not that I’m suggesting in the least the Hauptwerk Paramounts are ugly or need excuses; indeed, that is the dubious enthusiast’s suggestion! ... But undoubtedly certain aspects of Paramount’s and other simulations — notably the tremolo — are obvious compromises, some perhaps inevitable, some doubtless avoidable with more work aka money. ... Life is like that — but don’t tell me it’s good because it has warts . And then I finally noticed the Paramount 320 piano is compressed! It’s been tampered-with! ... Despite a no-doubt warty decrepit original, this one has punchy attack and extra-long sustain! ... How can this be? How does that preserve the sacred warts!?!?!? The Miditzer “toy counter” — oogah, bird tweet, phone ringing, my beloved gong, etc. — at least the 260SP flavor, is definitely superior to the Hauptwerk Paramount320’s. ... Or louder, anyway, particularly after I made them so, facilitated by dangerous software. ... Shockingly, I’d have to pay Hauptwerk $100s to even try that! ... Although I’ve found leaving the Paramount 320’s swell and great shutters closed — i.e., softest, which is the default whenever the program starts — and setting the audio to zero decibels (louder), makes the gong at least almost audible and also, as a bonus, turns-down the treble! (probably). Finally, I discovered the ridiculous warts claims of the Paramount partisan — were true! ... For instance, there’s a “clunker” at the F above middle C on the Paramount 320 “glock”: an obvious “tap” that shouldn’t be there. ... I’ve been playing this thing on and off since 1/13, and not until 8/14 did I notice! ... Or perhaps it’s more like, maybe some of the ranks were a little cranky, but I assumed that was just accidental. ... Now I can believe it’s intentionally slipshod even as the partisan claims — that in actuality it would’ve cost too much to fix these “authentic” things! ... Maybe it’s OK with the target market of decrepit real theater organists — what they’re used to! — but as a decrepit elderly incompetent organist who only gets to play chintzy electronic imitations, I’m not! ... 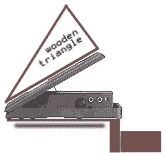 Neither the beloved Miditzer nor my costly Nord’s baroque actual real sample-set are “authentic” in this way. ... Well, except Miditzer shares the Paramount’s inauthentic tremolo — and also the Mitz has far more authentic latency! I originally created the soundset ... used by Miditzer about 13 years ago using an antique German application Klangsynth. I didn’t have access to sample a real theatre organ and the sounds are entirely synthetic with only my ears to transfer the theatre organ sounds from recordings into Klangsynth and thence construct the samples. I think I cheated slightly with one or two of the percussion sounds and based them on real samples. Still, there’s not much you can’t create with Klangsynth in spite of its creakiness although tremulants are easier to add in the console software. The theater organ for me starts with the tibia, a lovely hollowish-sounding flute, usually tremoloed to what normal people might consider excess. ... The Paramount 310’s is nice, but there’s an obvious grittiness, and listened-to closely I can hear distortion throbbing with the tremolo. The Miditzer tibia has no such artifact, presumably because Miles didn’t add such an effect. Sometimes the 310’s tibia sounds annoyingly gritty; sometimes it’s a lovely breathiness. And sometimes the Miditzer’s is sweet and throbbingly pure; ocassionally dull. ... Actually I realized recently they’re probably different flavors; I noticed a Wright piece with a more “mitzish” tibia, flute-ier, hollower compared to the kind Paramount sampled, and the latter kind are also more common on the Wright CDs. ... But I’ll settle for Miles’ choice and obvious neglect of authentic warts. And anyway, I think reverberation in itself is beautiful. Alternately, computeristic trickery can “manufacture” the tremolo in real-time (providing synchronization and avoiding other problems). 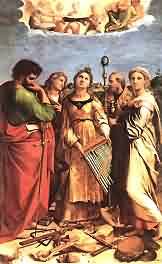 But such a practice is not faithful to the holy sampling faith, and without added financial grease aka R&D it might sound mechanical compared to #1 (i.e., sampled tremolo, like the “authentic” warts, is actually cheaper). What’s funny about this is that, despite forum moaning about the too-crude Miditzer versus the elevated Hauptwerk Paramount sampling, both do the all-important theater organ tremolo wrong! ... I never noticed until I happened upon the topic in a 2004 (!) post. ... And now that I’m paying attention, I suspect the randomizing of what was originally synchronized could be one factor in sour Paramount tuttis. ... But aside from that, the difference is hardly striking unless listened-for, and even then, on balance the individual note sampled tremolo mostly sounds as good as the synchronized flavor. Or better! ... But still, it’s definitely not authentic — no matter how many other warts it’s accompanied-by. ... And this just in: while groveling in Miditzer’s antediluvian soundfont, I discovered the tremolo was far more rococo than I had imagined in my ignorant bliss. At least with the tibia, Miles didn’t make different samples with and without tremolo, but implements the effect with different soundfont “instruments” (using the same samples) where the “Mod LFO” parameters are specified differently, or something. ... Seeming to produce a volume + pitch effect, which is what I hear in real theater organ tremolo anyway. ... But even ’though it’s machine made, it still isn’t “chuggy”, like the real thing. The warts are “correct” inasmuch as many of the organs even the super-human Mr. Wright played probably had equally shoddy assortments of poorly-voiced pipes, at least after decades of neglect. And a common solution would be larger registrations — it averages-out the faults — and such is the obvious tendency of most of the theater organ enthusiasts anyway. 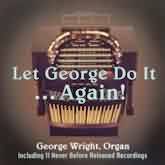 Although examination of the Wright oeuvre will reveal, I think, that he played more single stops with his later “salon” instrument and maybe some other machines with better maintenance. Before the warts revelation, I had already felt that Paramount+big registration==good versus Miditzer+soft==good, but now I understand why. Although the implied corollary, Miditzer+big=bad, isn’t so true, although the Paramount big registrations are better than the soft stuff — when I remember to turn-off the right tremolos. ... And thus you also get to the giant audio systems so beloved of the organistas, so much better for big registrations, ergo for Hauptwerk/Paramount. So, with Paramount you get the ranks of a real theater organ! while Miditzer provides the regulation of a good theater organ! ... And you can get both, probably, via spending vast sums with Allen or someone. ... At least until Nord makes one of these things. ... But once I got up-to-date on the warts situation, I started registering everything on the Paramount 320 with at least two stops: the breathy tibia will always be accompanied by a flute and/or diapason, and the result feels more playable, although not as cute. ... So maybe my Paramount problems were just a foolish affection for the lonely tibia? ... Which, however, I will certainly not renounce. As is usual with my careful random practices, I installed the 260SP on my test machine first. It was highly cranky, presumably the licensing scheme. Somewhere in the chaos, Windows 7 probably offered to run the 260SP program with administrative privileges, and I foolishly agreed. ... Don’t do that. ... Further random research indicates Win7 will foolishly suggest administrative privileges for any new copy of the 260SP exe file; like the man said, don’t. ... Maybe Windows does that after registering the 260SP in the obligatory elevated state? I really wanted to support the admirable Miditzer establishment anyway, and so I paid the freight and got my magic number, and managed to register the thing. Then I jejunely installed on the main Nord Imperium downstairs, licensing it without delay, but never agreeing to the satanic administrative deal as far as I remember. The result, as I now recollect in tranquility, was the test system 260SP crashed fairly regularly, but the downstairs one never did. Uninstalling/reinstalling the test system 260SP didn’t stop the crashing. Uninstalling, deleting the test system 260SP directory, and running the perilous Windows “regedit” utility and eradicating most traces of “Miditzer260SP” I could find in the registry — and reinstalling: that appears to have fixed it. I guess the moral of this story is don’t agree to run the 260SP — or probably any Windows program — with permanent administrative privileges. Official Miditzer recommends administrative privileges just to get the 260SP installed, but in a safer way, by turning-off UAC, but then turning it on again (?). ... My lack of telepathic insight failed me again in this case, so I took the hard road. This page has another lovely offering for the non-free Hauptwerk enthusiast, and Melotone Sound Productions wants $99 for themselves. But you get to download it without paying, so it’s a try-before-you-buy kind of thing. Google for it in the Miditzer maze somewhere (or maybe here or here), but it’s absolutely free. ... Wurlitzer made this thing embedded in an upright piano; Mr. Henry’s imitation has an entire virtual piano with its own stop tab and touch sensitivity; + a respectable Wurlitzer-style virtual organ. 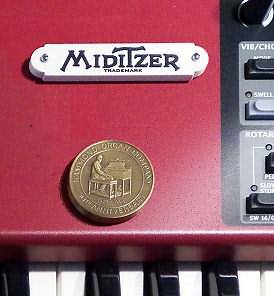 The Miditzer 160C is even more wacko than the other Mitzes, because to really make it go you’d want an 88-key MIDI keyboard + the usual 61-key upper manual. But that might well fit better into the wandering home organist’s hopes ’n’ dreams, since you might already have an 88-key Yamaha or Casio, and you could just add another cheapo keyboard for the upper manual. Of course then there’s the odd pedal board; and the usual endless cabling & technical agony. But at least my sustain pedal got used! ... Sadly, latency excuses won’t work here — the prototype piano/organ was obviously played near-enough the pipes for piano-level latency, or it would’ve been unendurable, but the estimable Henry’s imitation still of course shares the Miditzer’s delay — organ voices and piano, so at least it’s not harder to play than the 216. ... Another obscure treasure is the Miditzer 150 (for this page? or google it? 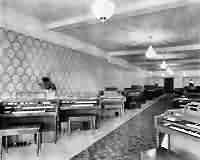 ), a “5 rank instrument typical of many of the Wurlitzer theatre pipe organs installed in smaller theatres.” ... Collect ’em all! But at last @ 10/15, version 1 software of the glorious Miditzer 216 is somewhere on the Mitz site — or maybe not, I couldn’t find in a brief search @ 7/31/17 — in an alpha state but seemingly quite playable. Improvements include the inspiring graphic shown, and Fluidsynth (sound) updates. Because of my saintly character I paid Hauptwerk’s $250 “basic” fare, if I still balked at the insane millionaire version and the seemingly-endless parade of enhanced Paramount flavors, although I eventually caved-in for the 320 upgrade @ $100. For comparably edifying reasons, I paid the $100 ticket for the Miditzer 260SP, which got me a more amusing — and dangerous! — Miditzer! ... But those’re the luxury tickets — a universe of virtual organing is available for free. A moderately amazing site is http://theatreorgans.com; I’m not entirely sure how informative it is — as with so many things, I just get confused — but it’s gaudy! ... Some pages play without permission. ... Somewhere in there I found a biography of Laurens Hammond thehammondorganstory.com/ which, since I’m an ignoramus, was surprising — apparently he was a jet-set intellectual type before jets. ... And the “Organ Classified Ads” were good. ... 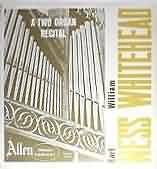 I was impressed by theatreorgans.com/walnuthill, but there may be many equally-astounding offerings. ... Most of these sites, to be sure, glitter with the dust of antiquity, the ruined temples of our time, with chirpy notices of exciting doings coming up in 2009 and pictures of theater organs played last who knows when. ... The Theatre Organ Academy forum is pretty much in the same shape, without pretty pictures; and threatre-sf forum is only a fading wraith. ... It might appear the world of virtual theater organs — well, any theater organs — has seen livelier times. ... But then somewhere on the VTPO forum there was a video of a callow youth playing his Hauptwerk ridiculously well, so who knows? But let us turn to tomorrowland and the state of the art at the impressive rubythevtpo.com site — just one man’s virtual organ — but what an organ! The virtual organs also apparently emulate the wooden shutter in a real organ with low-pass filtering, although like everything else this aroused controversy back in the day at the VTPO forum; I believe Nord — my “gold” standard — does do something comparable in their imitation baroque organ swell shutter. ... But even if the Behringer volume is less authentic — which its obviously superior range virtually so-to-speak guarantees — I still plan to use it anyway, because it sounds better. ... I should note that such vicious inauthenticity is not approved by many refined spirits at the VTPO forum, who are virulently pro-MIDI volume control. ... Which is really kind of odd — I mean, authentic MIDI? A Pipe Organ in the Living Room? I’ve concluded it’s a bad plan. ... Historically, the rich did install actual pipe organs in their living rooms. But those were great halls and they had armies of servants to maintain them, and once you had that giant room the idea was you wanted a sufficiently-loud instrument to fill it — before electronic amplification. But I live in sadly middle-class normal-sized spaces. An actual pipe organ in my living room would be a health hazard. Even a “practice” organ with a single rank of pipes would probably be too loud, and not so amusing. ... So I instead want an imitation classical/theater organ, and we are blessed to live in an age when a beautifully-realistic home electronic organ is eminently feasible — but not so ridiculously loud as a real instrument. ... 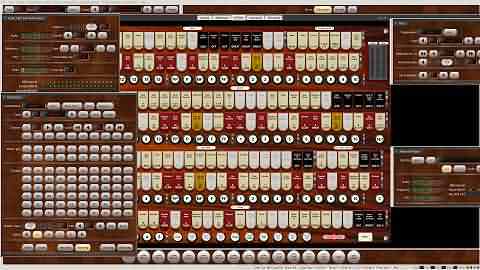 The enthusiasts with their console dreams also typically get carried away with the audio, but even some VTPO posts have noted that a vast array of virtual ranks — Paramount Organ Works’ model 450 fifty rank Hauptwerk for instance — requires, at the least, many speakers. I ordered two of these lovely plastic name plates from somewhere in the internet for around $30. They appear to be cunningly designed to curve-down a bit in the middle, so when you screw them on they’ll lie flat and not bow-out in an unsightly fashion. But I of course had no intention of screwing anything onto my precious Nord, so I cut-up some flexible magnet adhesive plastic, attached it to the back, and made my own Miditzer Magnet! ... But it tended to skitter around on the Nord, because of the slight plastic upcurve to the edges, and so I would bend it back most mornings, so it’d lie still.